The worst flooding in over a century has hit the Balkans, with the death toll having risen to 44 as they continue to recover bodies of the victims, with 12 alone recovered from Obrenovac on Sunday, 16 victims in Serbia, 27 confirmed dead in Bosnia and one in Croatia. Famous movie director, Emir Kusturica, has donated his two helicopters to Serbian rescuers to assist with evacuations. Russian relief workers in Serbia have evacuated more than 2,100 people over two days, including 576 children from flooded areas. On Sunday, two Russian cargo planes brought food, generators and rescue boats to the disaster-struck country. If that isn’t enough of a worry for those involved, another concern has crept up as landslides caused by the flooding are shifting Bosnia landmines, the Red Cross reports, stating “There are reports that landmines buried during the conflict and not yet removed are in some instances being shifted with the landslides, adding (to) the dangers of people living in the areas as well as rescuers. 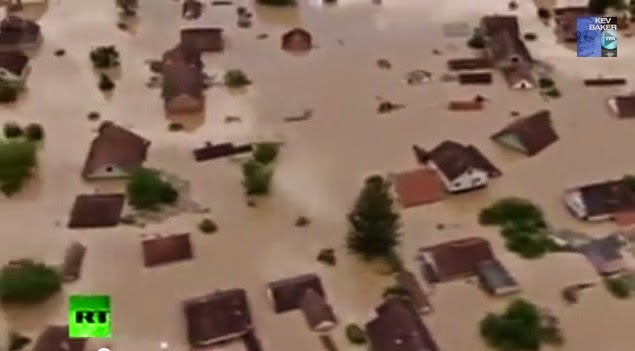 Below is video footage captured from above the historic and epic flooding in the Balkans.